Enjoy an evening of Magic and Polynesian Entertainment in Waikiki Created by Merlin Award-winning illusionist John Hirokawa, the Magic of Polynesia is a spell-binding night of stunning illusions, dramatic special effects, amazing sleight-of-hand and professionally choreographed Polynesian entertainment – all in our beautiful $7.5 million showroom in the heart of Waikiki. We hope you will thoroughly enjoy the show's grand vanishing acts, incredible levitations, fire knife performances, and much more. The Magic of Polynesia the creation of local boy and master illusionist John Hirokawa, Magic of Polynesia is a bewitching evening of music, dance, humor, electrifying pyrotechnics and an astonishing array of levitations, disappearances, reappearances, Houdini-esque escapes and other seemingly impossible feats. 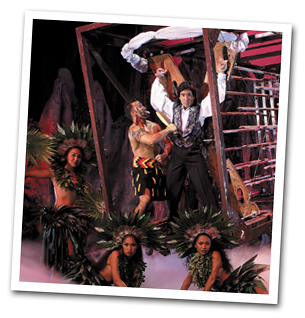 Staged in a $7.5 million state-of-the-art showroom in the heart of Waikiki, highlights of the show range from impressive sleight-of-hand illusions to vanishing acts on a grand scale. Interspersed throughout the show are mesmerizing Polynesian performances including graceful dances with Hawaiian, Tahitian and Samoan origins. John Hirokawa. The King Of Wow. Meet the master of ceremonies for "Magic of Polynesia." John Hirokawa. He’s both an expert illusionist and incredible showman. John grew up on Oahu and started his magic career at age six with a magic trick he learned from a library book. By age nine he was performing for luaus, parties, and conventions. At age 12, he appeared on stage with David Copperfield, and it was all uphill from there. After obtaining a business administration degree from the University of Hawaii at Manoa, John set out to make it big in showbiz – and succeeded spectacularly. He's won several awards, among them a Merlin Award for originality from the International Magicians Society, putting him in the company of David Copperfield, Harry Blackstone, Doug Henning and Siegfried & Roy. Today, John Hirokawa is the star of the most successful show in the state of Hawaii, attracting audiences from all over the world. 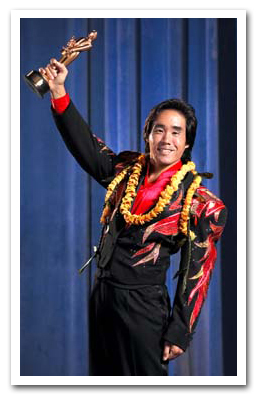 Don't miss the chance to see him perform in Magic of Polynesia at the Holiday Inn Waikiki Beachcomber Hotel. EXTENDED BY POPULAR DEMAND TO JUNE 30! Enjoy a complimentary local Hawaiian BBQ Chicken plate with purchase of the Magic of Polynesia Show Only. Nightly Show at Magic of Polynesia Theater in the Holiday Inn Waikiki Beachcomber - 2300 Kalakaua Avenue. Dinner Show seating will start at 5.45 PM while Show seating will start at 6.30 PM. Show starts approximately 7.00 PM. Round-trip transportation is available with $10 additional charge from Waikiki hotels and $25 from the Kahala Hotel. Kahala pickup requires a 2 guest minimum. The Magic of Polynesia’s menus contain a wide variety of ingredients, we assume no responsibility for guests with food allergies or sensitivities. Please inform us at least 48 hours prior to the service date for any special meal requests. Children under the age of 4 are free and must be seated on an adult's lap. If you require a seat for a child under 4, please purchase a child's admission. Due to fire safety regulations, our staff will assist customers with the storage of their strollers and large bags to keep aisles and walkways clear.